DESCRIPTION A spacious three bedroomed family house with an en-suite shower to the master bedroom and a downstairs cloakroom. In more detail the accommodation comprises: an entrance hall which leads through to a full width living room having double opening doors out onto the rear garden. The kitchen/breakfast room is extensively fitted with several integrated appliances. 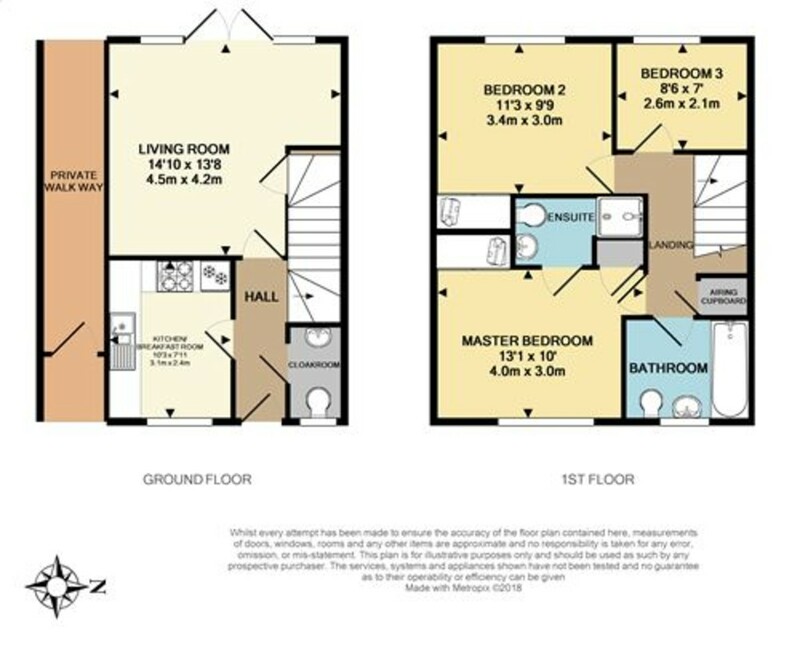 On the first floor the landing gives access to three good sized bedrooms, with the master bedroom having an en-suite. There is also a family bathroom with a modern fitted white suite. To the outside a drive is located at the rear of the property providing parking and there is further visitors parking close-by. The rear garden has a westerly aspect. The property also benefits from double glazed windows and gas fired heating to radiators. HALL Radiator, turning staircase to first floor, thermostat for heating. CLOAKROOM White suite comprising: w.c., pedestal wash hand basin, tiled splash back, radiator, double glazed window, extractor fan. LIVING ROOM Aspect to the rear with double glazed double opening doors and additional double glazed windows to either side, leading to patio and rear garden, two radiators, coved ceiling, TV point, telephone point, understairs cupboard. KITCHEN/BREAKFAST ROOM Comprising: worksurface with inset one and a half bowl single drainer sink unit with mixer tap having base cupboards and drawers under, space and plumbing for washing machine and dishwasher, further matching worksurface with integrated four ring gas hob and fitted oven under, wine rack, further base cupboard and drawer, integrated fridge/freezer, range of matching eye-level units, concealed gas fired boiler, extractor hood over hob, double glazed window, radiator, space for breakfast table. LANDING Airing cupboard housing pressurised hot water system, access to roof space. EN-SUITE Tiled shower cubicle with mixer shower, pedestal wash hand basin, w.c., tiled shelf, mirror fronted medicine cabinet, shaver point, radiator. BEDROOM TWO Recess wardrobe, radiator, double glazed window. FAMILY BATHROOM White suite comprising: shaped panelled bath with twin hand grips, mixer tap and hand held shower attachment, pedestal wash hand basin, w.c., tiled shelf, medicine cabinet, radiator, double glazed window, extractor fan. PARKING Situated directly to the rear of the garden is a drive providing parking with a gate giving access to the rear garden. Further visitors parking is located close-by. REAR GARDEN Adjacent to the property is a full width terrace with leads to the remainder of the garden which is almost entirely laid to lawn with flower and shrub borders, a stepping stone path leads towards the rear boundary where there is a timber shed.